Whether you’re visiting Key West to cut loose or to adventure, there are some things you just can’t miss during your stay in the Conch Republic. Here are 24 North’s picks for the must-see attractions in Key West. Little can rival a Key West sunset. With its fire-orange hues, amber rays and coral clouds, the Key West sunset is one of those phenomena worthy of a spot on your bucket list. And as if the Gulf’s red-orange glory wasn’t enough reason to get down to Key West, Old Town’s Mallory Square holds a nightly celebration featuring local musicians, magicians, performers, artists and even psychics. Trust us - there’s no better way to watch the Key West sunset. Albeit touristy, the Southernmost Point is one of those spots in Key West that just calls for a photo. So while you’ll come for the photo, what they don’t tell you is that you’ll want to stay for the view, too. With miles and miles of blue-green beauty in the distance, the Southernmost Point Buoy likes to brag it’s only 90 miles from Cuba. Unfortunately, that’s not exactly accurate - the Southernmost Point is actually 94 miles from Cuba. But who’s counting? Go get that photo. Not just a tourist attraction, the Green Parrot is a Key West institution. First opened in 1890, this dive bar is a permanent setting on the Key West landscape. Unpretentious and laid-back, this landmark pours strong and mixes well – often with live music. And after more than 100 years, the Green Parrot embodies why people started coming to Key West in the first place, and why they keep coming back. Originally a Union-controlled fortress, Fort Zachary Taylor played an influential role in cutting off the Confederate supply chain during the Civil War. However, these days Fort Zach is much more of a pacifist. 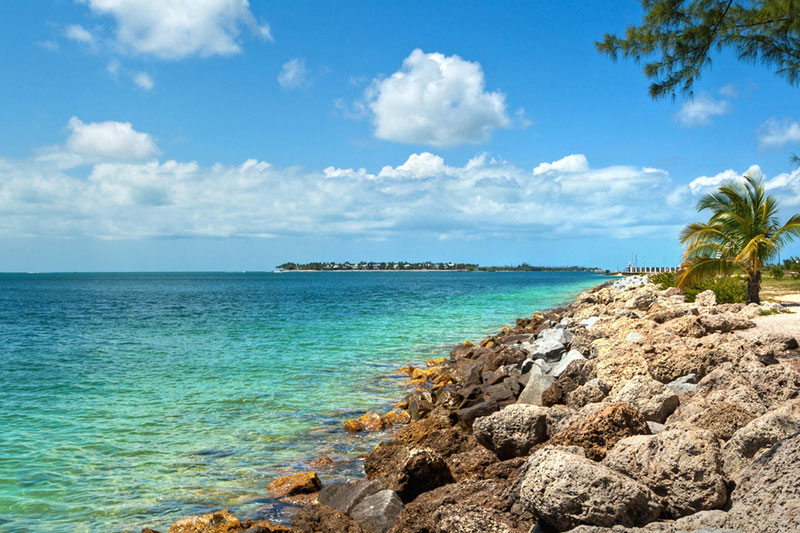 Known for being one of the best beaches in Key West, Fort Zach lures tourists with its gorgeous views, affordable pricing and historical insight. Pack a picnic or eat at the stand on site, but whatever you do don’t forget your water shoes – Fort Zach is notorious for its rocky beaches and waters.